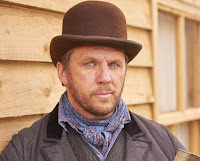 A Barnsley Historian's View: Jericho - a western filmed in Barnsley - I wanted it to be better! Jericho - a western filmed in Barnsley - I wanted it to be better! When it was announced in our local newspaper early last year that a new ITV historical drama based on the building of the Settle to Carlisle railway was to be filmed in the Barnsley area it sounded very positive. I imagined jobs for local people and a tv series depicting a part of our social history that hasn't made it to the screen very often. I don't watch a huge amount of television and hardly anything on ITV to be honest. Downton Abbey was the one exception. I have, however, studied an enormous amount of history over the years. I used to live in Sheffield and stories of the navvies that build the Totley Tunnel are hugely popular there. I've read factual history about navvies and novels about navvies. I thought I knew what we were going to get in this new series ... but we didn't. The prostitutes look far too 'frilly'. The wives and lodging house keepers are too 'decent'. Nowhere near enough beer is being consumed. The navvies are not rough enough. No construction appears to have taken place since the foreman played by poor Dean Andrews was blown to pieces in the first episode. The cabins are just too neat - honestly I think someone has been down to B&Q for some fence panels and just knocked them together at the corners, that or the local garden den and shed manufacturer was onto a good thing last summer. Ok, the plot about the widow having to look for work and setting herself up as a 'fancy' lodging house keeper just about works. But where on earth was she carrying that tea set in their hand luggage? The widow of the aforementioned foreman who attempted to sell herself to pay the rent was stretching it a bit - surely the lads would have had a whip around for her. And having no extra rooms in her cabin to take in lodgers was a feeble excuse, she had a roof and walls, that's better than the outdoors. I liked the touch about the Tommy shop tonight - presumably once he's gained the trust of the navvies and their women the new overman will start charging top rates himself now he's cornered the market. However the final straw this evening was the blatent disregard for 'proper' history. The speculator, Blackwood, and his 'just business because we have history' bride got married in his ancestral home in front of a mystery figure. The only new character that appeared in the house subsequently was a lawyer. No sign of a clergyman, a registrar or even a marriage licence. This is meant to be the 1870s. Marriages could only take place in registered religious premises or the local register office - as far as I am aware. I have swiftly flicked through my copy of Probert (2012) Marriage Law for Genealogists and only Jews and Quakers were exempt from the usual rules. In those days if Methodists married in their own place of worship a registrar had to be present. This is apart from the complete lack of urgency or backbone shown by the hero when dispatched to get a doctor for the girl suffering from what I assume was diphtheria. We are now three episodes in and I am seriously thinking of not bothering with the rest - it's only the chance of some Barnsley scenery that is keeping me going. The OH does think he recognised a rocky hillside in one shot this evening. What a shame. It could have been good. There are people out there who have made a lifelong study of this period of history - would it have been so bad to have asked one to come along and take a look at the script, the clothes and the woodwork?